Cape Town - Lexus has refreshed three of its models in 2016; its CT hatchback and luxury SUVs, the RX and LX. The 1.8-litre Hybrid powered Lexus CT200h hatch is now available with four new bi-tone (two-tone) colour schemes. The bi-tone scheme is created by combining high gloss black treatment on the roof and pillars, with a choice of four stylish ‘body colours’ adorning the metal below the ‘waistline’. Customers can choose from 'White Quartz', 'Sonic Titanium', 'Mercury Grey' and 'Morello Red'. Mono-tone traditionalists are also catered for, with the addition of a new bronze colour. Audiophiles will appreciate the newly added digital media holder housed in the centre console, which provides secure storage for portable music devices and improved interface via the USB, AUX and Bluetooth systems, says the Japanese automaker. Following the launch of the fourth-generation RX SUV earlier this year, the top of the range RX450h SE’s luxury credentials are bolstered by changes centred on enhancing convenience. Rear passengers now have electric adjustment for the second row seats, as well as seat heaters. A panoramic view monitor replaces the previous reverse camera, offering a wider field of vision, improving visibility and enhancing convenience, says Lexus. The Lexus LX has established itself as a formidable luxury SUV, with demand often exceeding supply. Befitting its status, the Lexus SUV flagship inherits a number of safety and technological upgrades. A newly added pre-crash electronic safety system scans the road ahead, constantly monitoring vehicle distance and warning the driver of potential obstacles impeding vehicle approach. The system is also capable of taking corrective action, increasing brake pressure, closing windows and adjusting vehicle dynamics to prevent a collision, says Lexus. Integrated into the pre-crash system is adaptive cruise control, which allows the vehicle to maintain a safe following distance - adjusting speed autonomously - to provide peace-of-mind cruising. Lane keep assist is now also added. Adaptive high-beam system (AHS) automatically alters the field of light provided by the LED headlamps to shield oncoming vehicles from the high-beam illumination without deactivating the high-beam function. To complement AHS, sequential turn signal illumination is included. 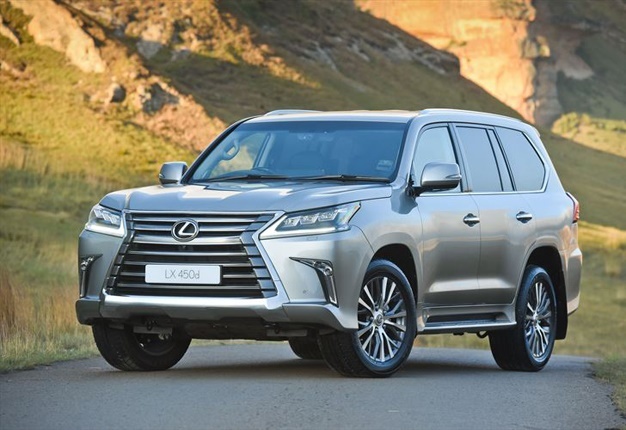 The Lexus LX is available in two models, the petrol powered LX570 features a 5.7-litre V8 (270kW/530Nm), and a turbodiesel powered LX450d (195kW/650Nm).